Cryptocurrencies like bitcoin have to solve two and a half important problems if they are to become currencies: 1) Unstable values 2) High transactions costs 2.5) Anonymity. Basecoin's idea is to expand and contract the supply so as to maintain a stable value. If the value of the basecoin starts to rise, more will be issued. If it falls, the number will be reduced. If Basis is trading for more than $1, the blockchain creates and distributes new Basis. These Basis are given by protocol-determined priority to holders of bond tokens and Base Shares, two separate classes of tokens that we’ll detail later. If Basis is trading for less than $1, the blockchain creates and sells bond tokens in an open auction to take coins out of circulation. Bond tokens cost less than 1 Basis, and they have the potential to be redeemed for exactly 1 Basis when Basis is created to expand supply. Aha, basecoins get traded for ... claims to future basecoins? You should be able to see instantly how this will unwind. Suppose the algorithm wants to reduce basecoins. It then trades basecoins for "basecoin bonds" which are first-inline promises to receive future basecoin expansions. But those bonds will only have value during temporary drops of demand. If there is a permanent drop in demand, the bonds will never be redeemed and have no value. They are at best claims to future seignorage. Any peg collapses in a run, and the run threshold is mighty close here. Just how are the bonds different from the basecoin itself? I presume you can trade the bonds too, so they are just as liquid as the actual basecoins. Or, in milliseconds, you could trade a basecoin bond for a basecoin and then the receiver back again. So, since they now pay interest, they are better in every way as an asset to hold. In monetary theory "bonds" are crucially less liquid than "money" allowing bonds to pay a higher interest. The whole point of cryptocurrency is to make everything liquid. There can only be lasting seignorage, a "money" that pays less interest than "bonds," if the money is in restricted supply. The fact of cryptocurrency is, even if you limit the supply of your currency, a competitor can come along and supply a different currency. What would be a better way? In a liquid market with competitive currency supply, only backed money can have lasting value. It's time to face this hard truth. Suppose that when you trade a dollar for a JohnCoin, that dollar is invested in Treasury bills, or best of all interest-paying reserves at the Fed or overnight treasury debt. Then when on net people want less JohnCoins, the sponsoring entity can always deliver dollars. I have just reinvented the Federal money-market fund. Let it be reinvented! Money market funds are not great at low-cost transactions. Marrying low-cost transactions to a money market fund would be great. The money could also be invested, together with a substantial equity tranche, in a combination of a pool of mortgage backed securities and reverse repos at the Fed. This isn't completely run proof, but would offer greater interest. I have just reinvented the Bank. But with low-cost electronic transactions. Put another way, just what happened to the dollars that got turned in to basecoin when the coins were created? Why are they not still there to back basecoin retrenchment? Answer: "Base shares." They have gone into investors pockets! And quickly out to real dollars where frustrated later basecoin investors can't get them. Yes indeed, the seignorage from printing a new money can be an attractive investment. It is interesting to me how the cryptocurrency community seems to be painfully re-learning centuries-old lessons in monetary economics. The Fed was founded in 1907 in part to provide an "elastic currency," exactly the lesson missing from bitcoin and at the center of basecoin. Alas, the Fed trades money for treasury bonds, backed by taxes, not for Fed bonds backed by future seignorage. And laws against using foreign currency or issuing private currency help a lot. Basecoin buyers will soon learn the lesson that bonds cannot pay more interest than money in a liquid market, and that claims to future seignorage cannot back money in the face of competitive currencies. I found a very nice primer on stable value cryptocurrency, by Haseeb Quershi, one of the few posts in this subject that makes sense to me. He divides the source of value of cryptocurrencies into "fiat collateralized," i.e. backed by government debt, "crypto collateralized," like basecoin collateralized by first rights to future seignorage, and "non collateralized," like bitcoin trying to have value only by their own scarcity. I object a bit to "fiat collateralized." Our government debt, and the money that it promises, is collateralized by our government's promise to tax its citizens to repay the debt. Pure fiat money is not collateralized at all. Other than that though, the post is excellent. Quershi complains that backed currencies need accounting and legal oversight to make sure that the backing really is there. Yes. This seems like less of a problem to me than it does to him. Federal money market funds are not hotbeds of Ponzi schemes. As I was finishing up this post, I learned that Basis just raised $133 million from investors. Rumblings around "the" valley where I live are that blockchain is The Hot Thing, and that investors are mad to throw money at any vaguely plausible associated idea. And a few that are not. Isn't the market telling us that the problem of "moving money out of China and Russia", or whatever is being done with all these cryptocurrencies, is more significant than the many issues you have thoughtfully articulated? "Cryptocurrencies like bitcoin have to solve two and a half important problems if they are to become currencies: 1) Unstable values 2) High transactions costs 2.5) Anonymity." 1. People will trade liquidity for stable value. 2. People will trade low manufacturing costs for high transaction costs. 3. People will sacrifice anonymity for acceptance. And so, why shouldn't a cryptocurrency be hand tailored to the buyers requirements? I want a currency that is very stable (low liquidity), has low manufacturing costs (but potentially high transaction costs), and has a high degree of acceptance (but a low degree of anonymity). My sister wants a currency that is highly liquid (but has a very unstable value), has low transaction costs (but is very expensive to manufacture), and is completely anonymous (but is not widely accepted). "In a liquid market with competitive currency supply, only backed money can have lasting value." I don't know. If a single cryptocurrency can be hand tailored to the buyer's specifications, that provides some degree of utility that does not require any real backing. Nonetheless, perhaps the cryptocurrency people are too shortsighted to understand that the selection of the backing for their currencies is far more crucial than the technology embedded in their currencies. The simplest currency issuer. The loan to deposit book is observed to be out of balance and interest charges applied. The model is simple because borrowers are ore-qualified to a measurable risk. The rebalance functions gets first notice, the function has a tiny wedge to keep currency losses about zero, or let it trend,up or down. It is stable, there is no seigniorage. Bu all traders need equal access, trading congestion effect them without preference. There is no time. But all the complexity has moved on to the prequalification problem, the system requires a fair, anc contract enforced, credit ratings. A system that proves, alst, I, a trader, keep the reserves necessary for cash in advance. This is the minimum state model for banking anywhere, I would think. What "laws against using foreign currencies" do you have in mind? EverBank (https://www.everbank.com/currencies/access-deposit) offers accounts in twenty foreign currencies. PNC Bank (https://www.pnc.com/en/corporate-and-institutional/international-services/multicurrency-accounts.html) offers accounts in thirty currencies. "This note is legal tender for all debts public and private." The law that establishes Federal Reserve notes as legal tender is the Federal Reserve Act of 1913. If you borrow $1 million in dollars from EverBank or PNC Bank, will they accept Rupies, Rubles, or Dinars as repayment on the loan? "United States coins and currency (including Federal reserve notes and circulating notes of Federal reserve banks and national banks) are legal tender for all debts, public charges, taxes and dues. Foreign gold or silver coins are not legal tender for debts." For example, the law that says you must pay your US federal income tax in US dollars. "Publication 54 advises taxpayers that they must pay their taxes in U.S. dollars. However, sometimes a taxpayer will send a payment in foreign currency and is unable or unwilling to substitute the payment for one in U.S. dollars." Write the applicable transaction code, amount, and type of currency in the remarks section." Request for foreign cash conversion: 2500 Euros TC 670 DPC 10." And so in fact, you can pay your federal taxes in foreign currency and request that the U. S. government perform the conversion. However, the conversion rates are not spot market rates, but instead some aggravated average over time. I have never done it, but I suspect that conversion by the U. S. government would be limited to currencies of "advanced countries" - Japanese Yen, European Euro, Australian / Canadian Dollar, etc. The law (as written) states that the U. S. federal government must accept U. S. dollars as sufficient for discharging a tax liability. It does not say that the government is precluded from accepting other means of payment. The law does state that creditors of the United States must accept U. S. dollars as sufficient for payments of debts owed by the U. S. federal government. Finally, I suspect that most private debt contracts (mortgages, car loans, etc.) are written so that whatever currency is borrowed must be repaid in kind. IRS publications (and instructions to forms) are not "the law" and have no weight as such. The law, 21 U.S.C. 6316, gives discrection to the IRS Commissioner; however, current regulations limit the payment in foreign currency to the very, very limited circumstance listed in Temp. Treas. Reg. Section 301.6316-1(b) (the four conditions listed are cumulative). Finally, it is an open question whether "bitcoin" and other "crypto-currencies" are "foreign currencies" for purposes of these rules. I would wager a bet the courts would rule "no" under the present circumstances (they are not issued by any sovereign government). If foreign currency is forwarded to the IRS as payment, it is converted to US dollars at the expense of the taxpayer and at the applicable exchange rate. Thus, the debt is paid and extinguished in US dollars. This is the same as if I were to convert the euros in my account and transfer dollars to the US Treasury. It really doesn't matter at which end the conversion is made. Bottom line: US federal income tax liabilities are assessed and paid in US dollars and not foreign currency, much less cryptocurrency. As regards bitcoin and other "crypto currencies" as "foreign currency", see IRS Notice 2014-21 (ruled treated as "property" and not as "foreign currency"). Thanks for the reference to 21 USC 6316, however, from what I can tell there is no section 6316 of Title 21. Title 21 (Sections #1 thru #1499) covers "Food and Drugs". Title 26 covers the Internal Revenue Service and Title 31 covers the U. S. Treasury - Money and Finance. 1. If you are playing poker and you do not know who the mark is, you are the mark. So it is with cryptocurency. Its like the old 3 card Monte. You will always lose. 2. Blockchain is not about lower transaction costs. It is about security and transparency. The price of those two is speed and cost. The more transactions there are, the longer the blocks are, the more processing it takes to verify the blocks, the longer it takes, the more it costs. I would like to mine some JohnCoins. Does that involve sending beer and sandwiches to the Hoover Institution? See Herbert Hoover and the "Bonus Army". "Many of the war veterans had been out of work since the beginning of the Great Depression. The World War Adjusted Compensation Act of 1924 had awarded them bonuses in the form of certificates they could not redeem until 1945." Mining JohnCoins involves sending John $100 and waiting 21 years for them to arrive. I kid of course. At that time those "bonds" payable to war veterans were highly illiquid (unlike today's modern government bond market). Meaning, it I wanted to cash out those bonds early, I as a war veteran could not sell them to someone else. And so there is a whole range of literature discussing the Great Depression as a liquidity problem (Milton Friedman - the Great Depression was the Fed's fault) as opposed to the Irving Fisher debt deflation analysis. "It is interesting to me how the cryptocurrency community seems to be painfully re-learning centuries-old lessons in monetary economics." So true! At least some members of the cryptocurrency community are learning. The gold bug community never bothered to learn. Some of these currencies are better thought of as tokens whose value stems from allowing the owner to do things on the associated blockchain system. So Ether lets you run computations on Ethereum. In that respect, a cryptocurrency is more like a chip from a casino--it has value in that casino regardless of its liquidity or hardness in non-casino markets. John, the U.S. dollar is worth 1 U.S. dollar, and a $1,000 face value U.S. Treasury note pays $1,000 in U.S. nominal dollars at maturity. As we've all seen in the past, the purchasing power of a nominal $1 bill has eroded considerably over the past 50 years. One can laud the U.S. dollar and claim that it has bed-rock value as a reserve currency, but as a store of value it is a lamentable failure. Not even convertibility to gold served to uphold its value, as the Nixon administration's machinations amply demonstrated. All that can be said for a fiat currency, and the U.S. dollar is a fiat currency, is that it is useful as a token and a unit of account for purposes of preparing tax filings, and paying federal, state, and local tax liabilities. For all other purposes, apart from buying groceries and consumable services, it is a poor substitute for value. "He divides the source of value of cryptocurrencies into "fiat collateralized," i.e. backed by government debt, "crypto collateralized," like basecoin collateralized by first rights to future seignorage, and "non collateralized," like bitcoin trying to have value only by their own scarcity." John, I think you misinterpreted the chart. 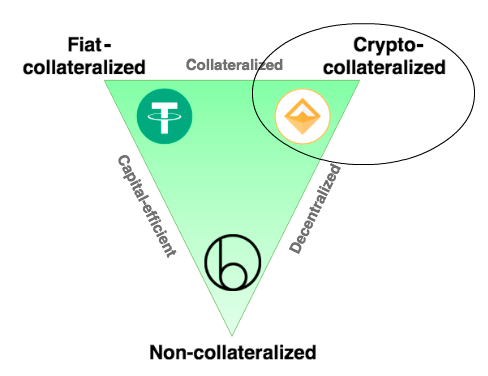 Basecoin, not bitcoin, is the non-collaterized asset in the bottom corner of the triangle chart. "Crypto collateralized" refers to other stablecoins like bitUSD. Very interesting post, but I think the analysis of the "fiat collateralized" is actually too simplistic. Fiat money *can* actually be collateralized without any government debt involved. All it needs for this are debt contracts denominated in that currency PLUS appropriate means to enforce those contracts. For example, if I am the issuer of "funny money" and can convince you to sign a debt contract about you owning me 1000 funny money units, then funny money already has a value that will be well greater than zero. Why? Because you will be willing to give away goods and services to acquire some funny money units in order to pay down. Therefore, it *could* be possible to have some kind of completely government independent fiat money (even crypto currency based) with collateralization *if* it would somehow be possible to establish an appropriate amount of debt contracts denominated in that currency. Of course, trying to establish this would prove to be some kind of chicken/egg problem. "Fiat money can actually be collateralized without any government debt involved. All it needs for this are debt contracts denominated in that currency PLUS appropriate means to enforce those contracts." Yep. Government debt does not need to exist. For a lot of it's early history, there was little U. S. federal government debt relative to the size of the economy. In fact, the U. S. central bank (Fed) can and did operate without open market operations (FOMC) from 1913 to 1933. Not only do you need legal enforcement of debt contracts, you need some way to consolidate debt contracts around a common currency (taxes) and you need someone who will lend when no one else will (central bank). Taxes payable in dollars and a central bank lender of dollars will need to exist. Taxes create a demand for dollars above other currencies (including those created by private banks). A central bank creates a supply of dollars by lending them out specifically to private banks. I see that taxes can help foster demand for a specific currency, and will especially make a currency "the" currency within national boundaries. But I don't see how taxes are absolutely mandatory to maintain a fiat currency. It is very well thinkable, that a fiat currency could exist without taxes being denominated in that currency. Regarding the central bank: It is true that in every fiat money system, there needs to be *some* kind of issuer, regardless of wether you call it central bank or something else. It is not necessarily true that this issuer needs to lend when no one else will (but yes, it would be a good idea to do so actually). In the history of fiat money *and* central banks, this simple principle has more than often been violated. "But I don't see how taxes are absolutely mandatory to maintain a fiat currency." Yeah sure, there are other ways to do it. Taxes serve the additional purpose of funding the government. It's just easier to kill two birds with one stone rather than using one policy to create a demand for a common courtesy and then another separate policy to fund the government. Yes. That was a typo. Title 26. There is no section 6316 in either Title 21 or Title 26 of US code. Wow, sorry about that. Of course the law just took effect yesterday (April 25, 2018). Hey John, how does this law float your boat? "The Secretary is authorized in his discretion to allow payment of taxes in the currency of a foreign country under such circumstances and subject to such conditions as the Secretary may by regulations prescribe." Notice that word - "discretion". Didn't your buddy John Taylor go on and on about discretionary economic policies? Where is the outrage from the economic community?? Section 6316 was in effect in 1954. The source I cited includes the reference "Text contains those laws in effect on April 25, 2018" which you appear to have misinterpreted. "To give government officials the power to bail out firms at their discretion, especially if those officials are elected or political appointees, is practically to guarantee a bailout." And you don't think the discretionary authority given to the Secretary of the IRS is politically motivated? Thank you for the correction. For all the complaints that Mr. John Taylor and Mr. John Cochrane have made about discretionary central bank policy, here is a law that went into effect over 60 years ago that directs the U. S. Treasury Secretary to use "discretion" when deciding whether to allow payments on taxes in a foreign currency. "Alas, the Fed trades money for treasury bonds, backed by taxes, not for Fed bonds backed by future seignorage." I'm not sure I see the difference. The Fed could manage the dollar supply by trading money for any asset, not just for Treasury bonds. Why does it use T-bonds? Probably because Treasury debt was a standard security already in large supply in 1913. I don’t understand why Fed bonds are not a feasible alternative; is tradability the issue? Would it help if the Fed bonds sold to the dealer bank had the CEOs’ Social Security numbers printed on them in bold type? My point is that dollars are not backed by the government’s tax authority, but only by the “network effect.” Of course, the dollar’s network effect includes the U.S. government’s power to force vendors and lenders to accept dollars as payment. "The Fed was founded in 1907 in part to provide an "elastic currency," exactly the lesson missing from bitcoin and at the center of basecoin. Alas, the Fed trades money for treasury bonds, backed by taxes, not for Fed bonds backed by future seignorage." "The Fed could manage the dollar supply by trading money for any asset, not just for Treasury bonds. Why does it use T-bonds?" The Fed trades money for fixed term liabilities that have zero chance of default (government bonds) because that allows the monetary base to be elastic and both expand and contract. Money supply expands when bonds are bought by the central bank, money supply contracts when government pays back it's debts to the central bank. That is why the central bank doesn't buy private sector bonds (default, bankruptcy risk) or other private sector securities - equity is indefinite term and does not retain the level of legal protections that debt does. Finally, "Fed bonds" amount to interest paying currency (John correct me if I am wrong). They allow for monetary expansion but not contraction. Apparently John likes his currencies to be flexible in one direction, but rigid in another. You're right that the Treasury repaying its debt contracts the money supply, but the usual method for tightening policy is the Fed selling (any?) securities in open market operations. Your point is that if enough of the bonds on the Fed's balance sheet defaulted, then the Fed would have little or nothing to sell in exchange for money. That's a pretty extreme case, but default risk is probably worth considering. The central banks of Japan, Europe, and England have buying a lot of risky securities (covered bonds, corporate debt, even equity ETFs). It sounds like your hypothesis is that these banks' ability to tighten the monetary base in the future is now compromised to some small degree. Interesting thought. "You're right that the Treasury repaying its debt contracts the money supply, but the usual method for tightening policy is the Fed selling (any?) securities in open market operations." Incorrect, the usual method for tightening policy is for the central bank to raise the discount rate. Large balance sheet operations are a relatively recent phenomenon for the U. S. Fed. And the U. S. monetary base only contracts when the U. S. Treasury pays back debts owed directly to the Fed or to some private bank that borrowed from the Fed to buy U. S. Treasury debt. The choice to reduce to monetary supply (IMHO) should be left to the individual borrower, not the central bank as lender. Do you believe that the Fed should have the ability to contract the monetary base on it's own accord and possibly to $0.00 through open market operations? "On the other hand, this intelligent expansion of the money supply is exactly what the Fed did in 2008 to prevent a repeat of the Great Depression." I can't say I've ever heard the Fed's 2008 policy described quite that way before. Between this and the paper's use of the QTM (at least from the perspective of "A Restatement"), I bet Friedman is rolling over in his grave - though I'll make that bet only in basiscoin bonds. Can someone remind me: what problems do cryptocurrencies solve, other than money laundering, tax evading, and drug trafficing needs? The confusion is common. There are no crypto currencies, there are crypto wallets and hashed ledgers. There is no equivalent of gold dust, I cannot give you some digits and have you verify them yourself. We can do that with public key wallets. Cryptop works like that blue strip on a $100 bill, it is a publickey. Every merchanthas the secret eye, it can decode the stripoand verify it is a hundred. We can actually make real crypto coins, and have done so using one of those chip credit cards. Some one made it generate public key digits while keeping accurate account and hard to counterfeit. Now that we know what a crypto currency is, we know why we want it, it can trade robotically a thousand time a second. There's another aspect of transaction costs you haven't mentioned in the post. Bitcoin creates digital scarcity using a real scarcity, computational power and electricity. In order to prevent fraudulent behavior, the constant run rate of those real costs must be at least twice as high as the benefits of fraudulent activity. You protect the castle by constantly re-digging the moat, which imho makes the castle not all that valuable or worth defending. I thought cryptocurrencies are popular precisely *because* they are unstable. Insofar as "unit of account" goes, a supposed prerequisite for money, people in the old days traded grams of gold all the time, and the price of gold fluctuated (though of course not as much as bitcoin). You are right about Basecoin and wrong about Bitcoin and privacy. The global offshore banking system is a 30 trillion dollar market, privacy coins perform this roles much better than banks. People who live in the US don't understand how people in third world countries protect their net worth from tyrannical and corrupt governments. Swiss accounts are only on the reach of wealthy Chinese and Russians, middle class and poor people will be able to protect their money from corrupt politicians. This article shows why you are an academic and 23 year old kids are multimillionaires. There is work on a concept called an 'oracle'. An oracle is a system to supply information from the outside world, to the crypto world in a way that is similarly 'trustless' and decentralized using incentives and game theory. Data from oracles can then be used to trigger smart contracts. Assuming oracles can be successfully implemented, the problem of stability in the crypto space will be solved, because at that point, you can create futures contracts, and tie your crypto-asset to the value of whatever 'real world' asset you like. Your currency can even be customized to be stable for your own needs. For example if you were a programmer in San Francisco, you could have a basked of future contracts that would include the average rental rate in the area, electricity, and food items you normally eat. I expect that the problems of a stable crypto will be solved relatively soon, but I agree it isn't solved yet. Your oracle is a notary with accounting skills. And yes, you are right. Robotic notaries watch our trading protocols, making sure counter parties do not misbehave. Works great. Let's call them notaries. Suppose they used x% of basecoin issues to buy bitcoin (essentially gold reserves) instead of just handing 100% of the money to baseshare holders. Then the basebonds would be backed by BTC (a real asset) and not just the seignorage from future sales. Treasury bonds are backed by claims on future tax revenue; basebonds are backed by future BTC returns. I think that would break the current ponzi-like nature of the basecoin WP, if we assumed BTC itself has positive RP. I've done some calculations, and I've concluded (with proofs) that the current basecoin protocol only works if permanent demand for the coin increases over time AND temporary demand drops are not too large (this seeems identical to what you are saying). Otherwise you will eventually reach a classical currency crisis where demand for basecoin drops to epsilon > 0 overnight when everyone realizes the music has stopped. Once seigniorage dries up as planned and assuming the demand for bitcoins stabilizes, the only reliable source of revenue for miners will be commissions. They won’t be able to rely on seigniorage and speculation to pay their electricity bills. But why would a user pay a large fee to a miner? What additional security does this buy? Why not pay a tiny fee and free ride on the blockchain's security? And if everyone free rides, who will pay for mining? Then comes a problem: without expensive mining, how secure will the chain be? Blockchain is the new buzzword along with AI, ML, and Automation. At least with AI and ML, you get productivity gains, even if there is danger of bifurcating markets. What are people buying Bitcoin with again? Mmm hmm. Conference on the cross section of returns.